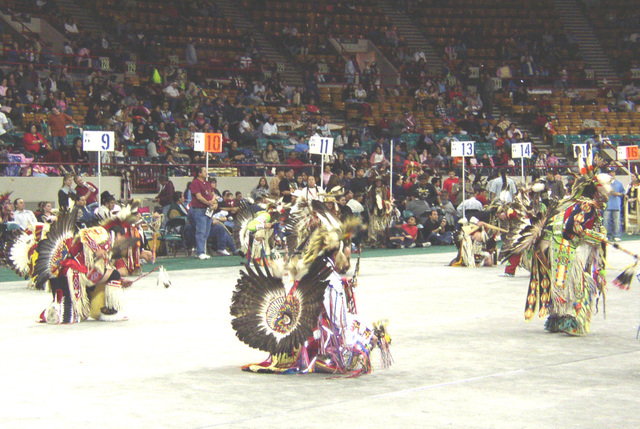 After several more contests the announcer called for an "All Nations" dance. 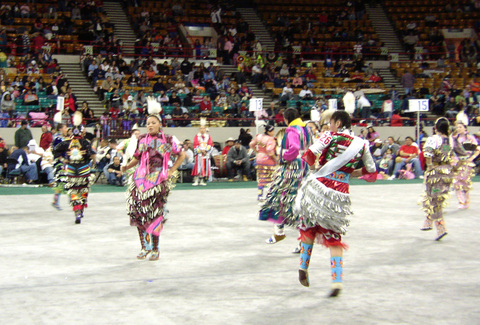 During this dance people of all ages, all backgrounds--in regalia or not--danced together within the oval of drums. What a great parenting/grand-parenting opportunity to teach cultural diversity. We took Clio onto the dancing surface and she watched the other young girls and tried to copy their steps. Many of the young girls played with Clio. 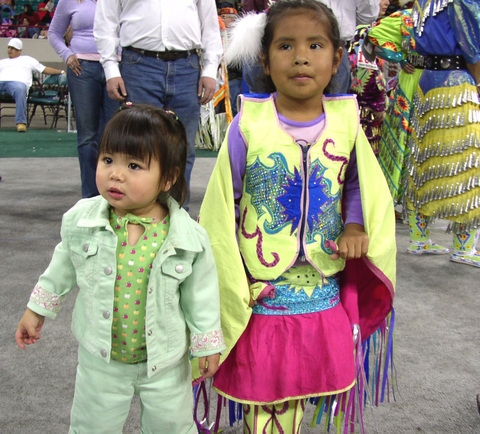 One young girl, dressed in shawl-dancing regalia, really loved Clio and danced around with us the entire 15 or 20 minutes we were on the floor. At the end we asked if we could take a photo of her with Clio. The anwer was yes.. I've only seen two Native dances many year ago: one on a ferry going up to Alaska and one in South Dakota....both would not allow photography. Is that something of the past or depends on region? Deb: PJ, here they are quite agreeable regarding photos of a group of dancers, if it is for private use only. If you are taking a photo of an individual, the polite and proper procedure is to ask. Anyone with a video camera is asked to pay a small fee to get a permit slip to film. They just don't want people making commercial products that might be sold for profit without getting permission. I try not to infringe on their privacy and in all the years we've been going, I've only had one person refuse to have his photo taken. Hey, I'd given up on you--and I delightedly see that you are back in full force. I'll do a catch-up. Love pow-wows!